It’s a Sunday afternoon in Vientiane, and visitors dropping into a small art gallery near the centre of town can’t stop smiling. On the walls, and scattered artfully about the room, are all kinds of animals – elephants, chickens, turtles – as well as playful human figures with articulated limbs, and slightly leery masks. At first glance, they are impressionistic, rough approximations of the real thing, rendered mainly in wood. 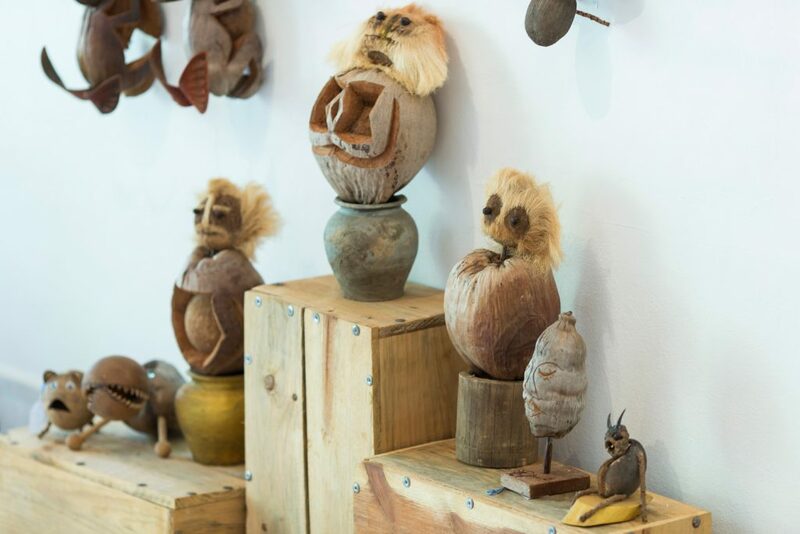 But on closer inspection, most of the objects are made from ordinary garden-and-countryside detritus: fallen coconuts, crumbling concrete, driftwood from the Mekong. It’s an effect both lovely and thought-provoking – how does a piece of bark suddenly become an elephant’s trunk so convincingly? What kind of whimsy does it take to see a turtle in a crumbled piece of cornice? Leuthmany Insisiengmay, the man behind these creations, is smiling too. He loves seeing people’s reactions to his work, loves the delight they provoke. 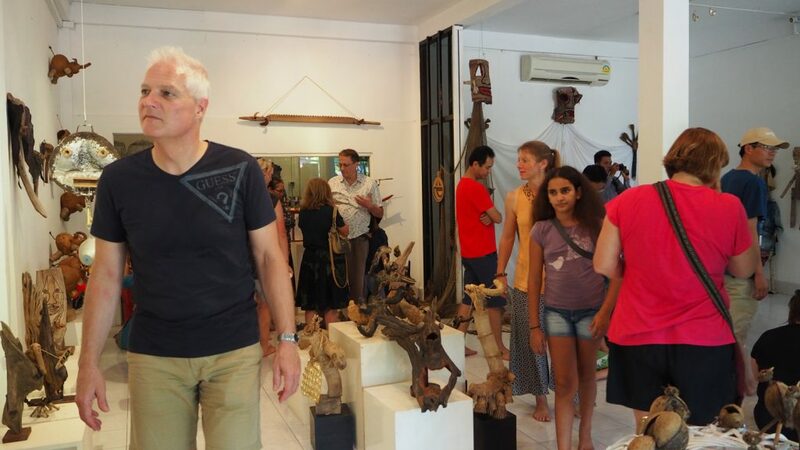 And on this Sunday afternoon, at the opening of his latest show at Vientiane’s I:cat Gallery, the 63-year-old is once again reflecting on the trajectory of his creative life. People didn’t always smile at Leuthmany’s creations – at least, not his visual artwork. As a writer, actor and stage director in the Lao Ministry of Culture, Information and Tourism for 10 years during the 1980s and 90s, he honed his craft as an artist and a storyteller. Later, he trained as a clown in France and performed in the Lao National Circus for five years. By then, he had already discovered how much he preferred a visual medium to a spoken one. “I was in the Ministry of Information and Culture’s drama section for a long time, but when it comes to talking, there will always be people who will never understand the content,” he says. He felt limited by language; foreigners couldn’t understand the stories he was presenting onstage, and he longed for another art form that could transcend these limitations. Once he began performing in the circus, he realised there were other, more universal ways of communicating ideas. But it was when he discovered a French theatre company using puppets and objects to tell stories that he knew he had found his medium. 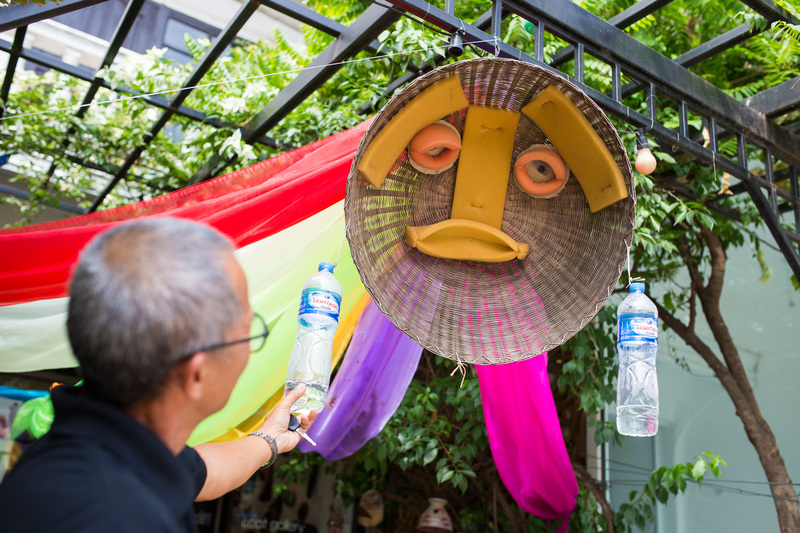 He returned to France to learn more about puppet performance, how stories are told onstage using objects rather than human figures and words, and eventually, in 2000, established Kabong Lao, the country’s first object theatre, still under the Government ministry. But when it came to making puppets, he relied on his own imagination, and what he had observed at other theatres. His lack of formal training has resulted in a unique style that is both distinctly Lao and immediately recognisable to audiences the world over. But when he first returned to Laos and began making puppet shows, the reaction from the ministry was dubious. The found objects and discarded household materials he used to for his creations was also something traditional art-watchers and government officials found confronting. His greatest fans are still mostly foreigners – and on this Sunday afternoon, the I:cat Gallery is filled with expats from all over the world, but few Lao locals – but he says little by little, his message about finding beauty and whimsy in the ordinary landscape is getting through. And Leuthmany’s journey has not been a solitary one; his son, Lattanakone, or Toh, has followed in his father’s footsteps, right from his high school days, when he began attending Leuthmany’s comedy artist workshops in favour of finishing school. Toh found himself equally frustrated with the medium, but not for the same reasons. “I always hated the old-fashioned clown because audiences seemed to look down on him as a crazy character or being so predictable,” Toh said in a past interview. He was with his father when they discovered Turak, the French group that brought Object Theatre to Laos, and together, they travelled to France to train in puppetry. 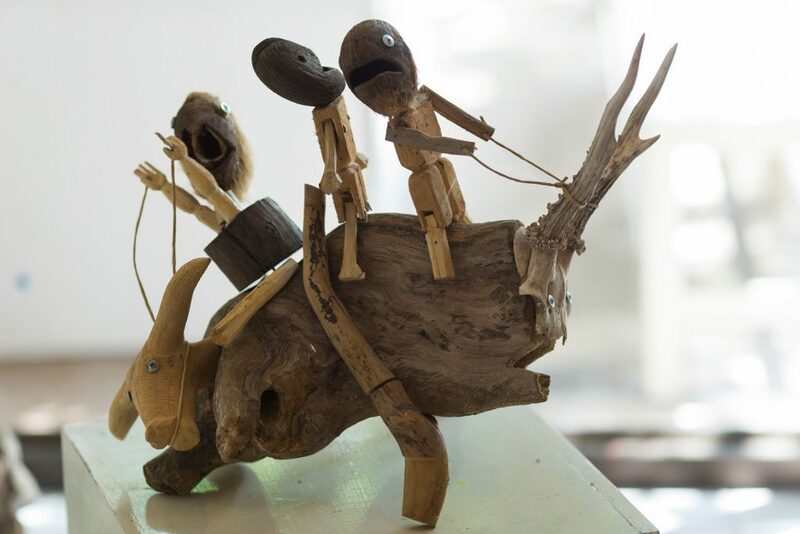 After travelling and performing with Kabong Theatre for several years, Toh was ready to branch out and form his own object theatre company, Khao Niew, which uses puppets conceived of and made by Leuthmany. Through his company, which receives funding from foreign donors, Toh is trying to preserve the ancient art of “Epok”, “Prateu” or “Bakteu” puppets – an almost forgotten art that remains integral to Laos’ heritage. But for his part, Leuthmany has always maintained that his productions, while part of an ancient Lao tradition, do not follow any set rules. 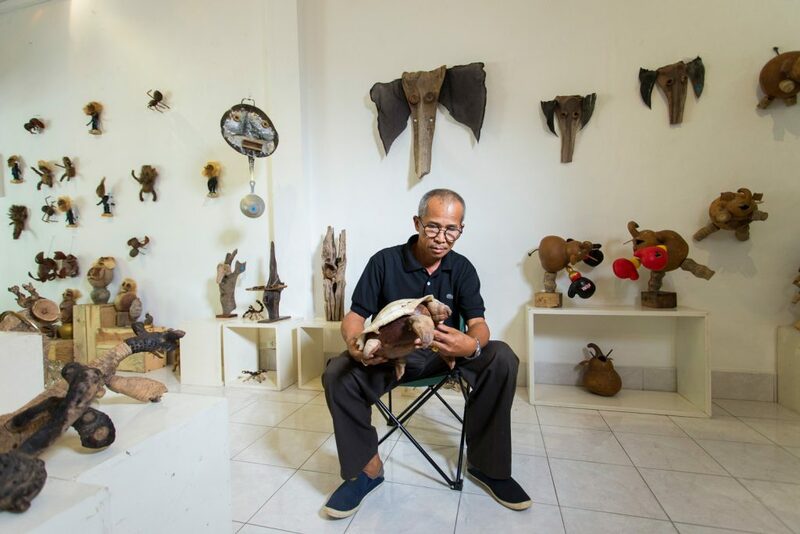 His avant-garde aesthetic sets him apart from other traditional Lao art forms, bringing dead materials to life. In this sense, he incorporates many Lao superstitions, both Buddhist and Animist, into his storytelling, and brings concepts of the afterlife of objects into a new realm. No wonder Lao audiences were initially shocked by his work. But Leuthmany has never been deterred by what others think. Using materials that would otherwise be wasted – used for fuel, thrown into landfill or discarded in the river – makes perfect sense to him when it comes to presenting his own country. “Some might call it ‘trash’ or ‘rubbish’, but it’s these materials that make my creations unique to Laos,” he says. And, having retired two years ago, he has suddenly found himself with endless time in which to indulge his whimsies and make ever more objects. While he still works as a consultant for Khao Niew, he says his own ideas could stretch on forever. It’s a state of contentment and childlike wonder that seeps into his work and off the walls upon which his work is displayed. “I’m already 63, and I can see myself doing this for the rest of my life,” he says.